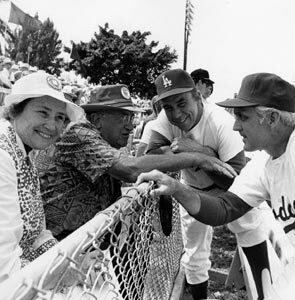 From left, Jackie Robinson, pitcher Ralph Branca and Pee Wee Reese. The captain of the Dodgers, Harold “Pee Wee” Reese was one of the stellar performers for 16 seasons at shortstop. Although many believe that Reese was named “Pee Wee” because he was small in stature (5’9”), the real fact was because he was a marbles champion in his native Louisville, KY (marbles were known as pee wees there) when he was 11 years old. Born on a small Kentucky farm, Reese starred for the Dodgers in 1940-42, before he served in the Navy for three years and then returned to Brooklyn (1946-58). 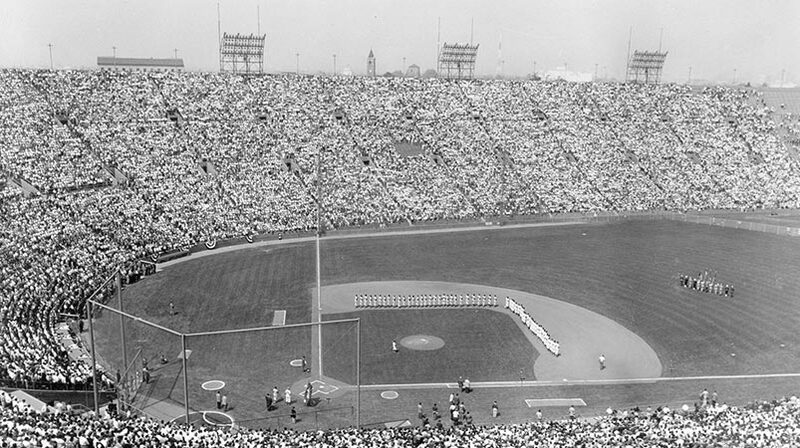 He played on the 1941 Brooklyn Dodgers National League Championship team, the first Dodger team to win the Pennant in 21 years. Winning would become familiar to Reese, as he was a member of seven Brooklyn Dodger teams which captured the N.L. Pennant. He was “The Captain” of the 1955 World Championship team. Reese was the force that kept the Dodgers together in the clubhouse. Any player who had a personal problem would always make his way to Reese’s cubicle, as he took him under his wing and offered friendly and helpful advice. It was Reese, as a Southerner, whose acceptance of Jackie Robinson, the first African-American player in the major leagues in 1947, which spoke volumes in breaking down the color barrier. In standing up for Robinson, he made a strong statement to his other teammates and helped to pave the way for more outstanding black players to join the majors. As double play partners, Reese and Robinson formed one of the best combinations up the middle. Reese led the N.L. in putouts four times, double plays twice and fielding percentage and assists one time each. He appeared in 2,014 games at shortstop for the Dodgers, more than anyone in franchise history, was a 10-time N.L. All-Star and is the Dodgers’ all-time leader in runs scored (1,338) and walks (1,210).